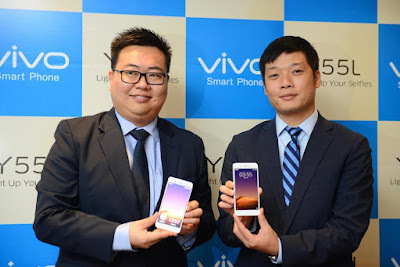 New Delhi : Premium global smartphone brand, Vivo, announced Kent Cheng as the new CEO for its India Operations. Cheng joined Vivo early this year and has been instrumental in the brand’s overall journey and has been contributing to making it a world class enterprise. In his current role, he will be building strong presence of the brand across the country through marketing, sales and strong customer service network and achieve the company's vision to be a leader in the Indian market. The 4G VOLTE enabled Y55L is powered by Octa-core Qualcomm Snapdragon with Funtouch OS 2.6 (based on Android 6.0). It is paired with a 2 GB RAM and 16GB ROM, expandable up to 128 GB giving users ample space for photos, videos and music. Y55L boasts an impressive unibody design with a 2.5D curved-edge Screen. It is equipped with 8 MP rear camera and 5 MP front camera with an impressive smart screen flash. Y55L will be available across India in two colors: Gold and Space Grey.